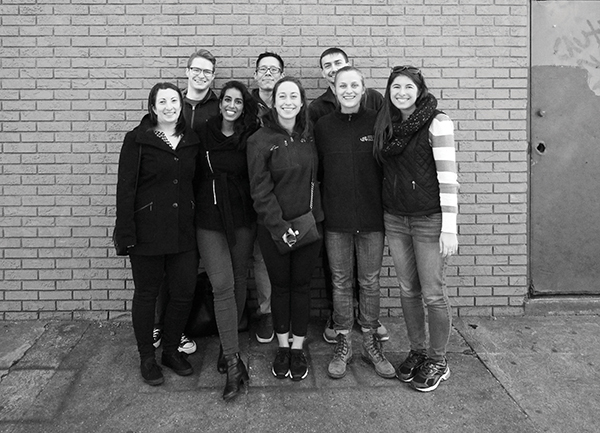 The medical students behind Drexel’s nascent Naloxone Outreach Program visit the storefronts of the Kensington section of Philadelphia, bringing first-aid training and Narcan to the shopkeepers, clerks and waitstaff who have become unwitting first responders in the opioid overdose crisis. In the quiet rear seating area of Sherry’s family restaurant in the Kensington section of Philadelphia, a Drexel College of Medicine student is prone on the tile floor, wedged between a pair of marbled green four-tops, unconscious. Or pretending to be, rather. He’s playing the role of a drug user who has overdosed on opioids. 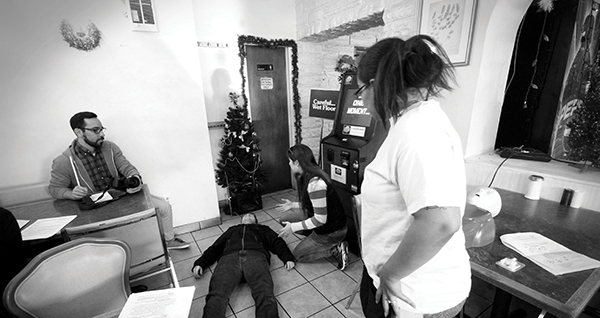 Close by, a small group of his classmates show a waitress techniques to safely revive him. As Sean Welch ’20 lies on his back, Kathleen Nelson ’20 positions his arms just so, extending one over his head and tucking the other under his cheek, so she can roll him onto his side and eliminate the risk that he will vomit and choke. Moments later, Camille Singh ’20 uses a dummy to show Yolanda, the waitress, how to tilt its head back and administer short, five-second rescue breaths, while Kristina Thompsen ’20 shows her how to administer naloxone, a nasal spray that reverses the effects of opioids and opens a window to survival. The lesson pauses briefly as the Market-Frankford elevated train rumbles over Kensington Avenue on its way to the Tioga stop a block north. Then another second-year student, Chris Fong ’20, describes the nodding off and the arrhythmic breathing patterns that suggest an overdose. He tells Yolanda about the rigidity in the body that indicates the synthetic opioid fentanyl, not heroin, as the culprit. He advises her to tell emergency responders she’s calling about an unresponsive individual, not someone going through an overdose. If you tell the dispatcher it’s an overdose, help may come slower, he warns. This isn’t entirely new to Yolanda, a petite ball of energy despite being up since 3 a.m. on this blustery fall morning filling patrons’ coffee mugs. She’s seen overdoses in the bathroom of the diner, and on her own street, where neighbors live with addiction. She’s seen the way people burst into anger upon being brought back, shocked out of their vegetative state, so she takes careful note as Fong demonstrates a delicate way to wake someone by applying pressure to their cuticle. When the training concludes, the students leave behind a couple doses of Narcan, the branded version of naloxone, and Singh gives Yolanda extra to take home. This is Drexel’s Naloxone Outreach Program (NOP) in operation. Since it began in spring 2017, students have conducted these informal community training sessions in over a dozen local businesses, distributing more than 100 doses of Narcan along the way. The students’ collective effort has already saved several lives, and with no end in sight for the crisis, it will surely save more. When the training is over, Yolanda serves up a breakfast of tamales, French toast and Spanish omelets as Singh and her fellow Drexel Med students recall the program’s origins. Inspiration for NOP came from Prevention Point, the city’s free needle exchange, and Streetside, a clinic that Drexel operates inside it. A classmate of Singh’s who was volunteering at Streetside introduced her to Prevention Point’s outreach coordinator, Elvis Rosado. Rosado spins busily through Prevention Point dispensing warmth and wisdom in equal measure to the staff and volunteers scattered throughout. The building, perched under the El like so much of life in Kensington, was once a church, and within its walls Rosado ministers to a diverse community in need. Teaching people to reverse overdoses is among the simplest ways to reduce the epidemic’s death count, which has risen to more than 2,800 Philadelphians in the past three years, including 1,217 in 2017 alone, according to the Philadelphia Department of Health. “Elvis is one man trying to Narcan-train Philadelphia,” Singh says. 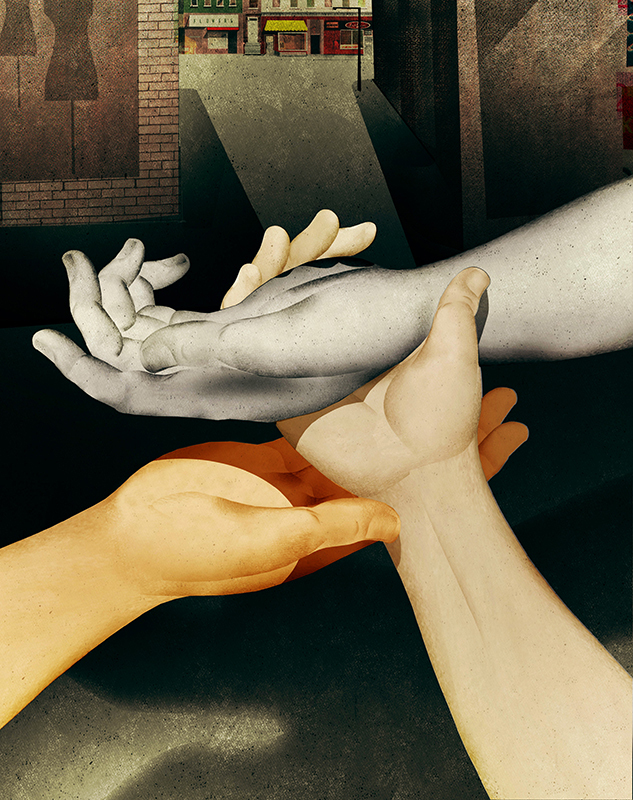 In her first year at Drexel Med, she saw an opportunity to help him. Singh established NOP under the umbrella of Drexel’s Health Outreach Program, which provides care to underserved Philadelphians. Since their first rain-soaked foray into the community last March, the students have strolled up and down Kensington Avenue, handing out Narcan in shops and bodegas, auto repair businesses and thrift stores. The group grew from five to nine volunteer members in its second year, and now spends weeks coordinating each neighborhood outreach, stopping anywhere they can find someone who wants to learn and help. Along the way, they’ve come to see that the portrayal of Kensington, regarded by many as a hard-luck neighborhood with a reputation as one of the country’s largest open-air drug markets, rarely reflects the reality of the community. The students want to change the perception that Kensington is a war zone and that addicts are to blame for their own troubles. The scientific and medical truth, Fong says, is that addiction is no different than diabetes, hypertension or any other malady. It’s a disease, one that requires close follow-up and management once diagnosed. During breakfast, one of Yolanda’s co-workers suggests that overdose victims deserve whatever fate brings them. Singh and the students see that sentiment as part of what needs to change in the culture. Welch understands this as well as anyone. He had six wisdom teeth pulled as a high school sophomore and left the dental surgeon with a Vicodin prescription and several refills. He started self-medicating with the prescription narcotic, numbing the physical pain he felt and the mental pain of undiagnosed depression, until soon he was sitting in class counting the seconds until he could take more. When his mother found him unconscious the summer before his senior year, he quit cold turkey. He suffered nearly one week of severe symptoms as his body went through withdrawal, but he managed to do something so many opioid users never can. Narcan 101 Sean Welch lies on the floor pretending to be an overdose victim while Kathleen Nelson demonstrates the recovery position for two observers. Singh asked Welch to join NOP after seeing him talk at a panel discussion he organized on the opioid crisis. His personal experience convinced him to help. “I would have just been another onlooker in the epidemic, instead of taking it upon myself to fix a small part of this enormous issue,” he says. Inside dollar dee-dee’s general store, a block south of Sherry’s restaurant, the team stops again, this time to train Howard, 51, a store clerk. Howard decided to take 15 minutes out of his shift stocking inventory to get instruction in the back of the store because he’d witnessed three or four overdoses just in the past few months. Tucked in tight among rows of laundry detergent and greeting cards, Howard listens as the students describe the factors that can put opioid users at increased risk of overdose. Using drugs alone is especially risky, for example, and so is purchasing them from a new source. Fong tells him to watch out for a locked jaw — an additional complication, common in fentanyl overdoses, that can prevent rescue breaths from working. The program’s volunteers don’t track the identities of the people who use the Narcan they provide, partly because the trainings often achieve their goal indirectly. 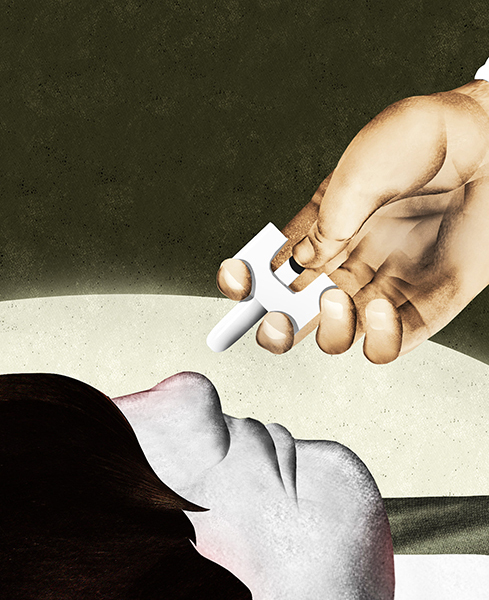 Those they teach have passed on their knowledge — and the Narcan — to other community members who have saved lives. This is exactly how the program was designed, as a beneficent pyramid scheme built on the best of intentions. Carnevale, now in her second year in the College of Medicine, has recently taken over leading the outreach program as Singh and her classmates enter their third year of medical school, full of rotations that make it harder to give the program full attention. As NOP has grown, its reach has expanded. In addition to training Kensington residents, medical students now teach other students — 200 and counting — in health profession programs around the region, including at the University of Pennsylvania, the Philadelphia College of Osteopathic Medicine and Cooper Medical School in Camden. This spring 2018 the program did its first undergraduate training at Temple University. Carnevale says there are plans for many more. NOP’s members are in contact with the Philadelphia Department of Public Health to stay current on where training is needed. 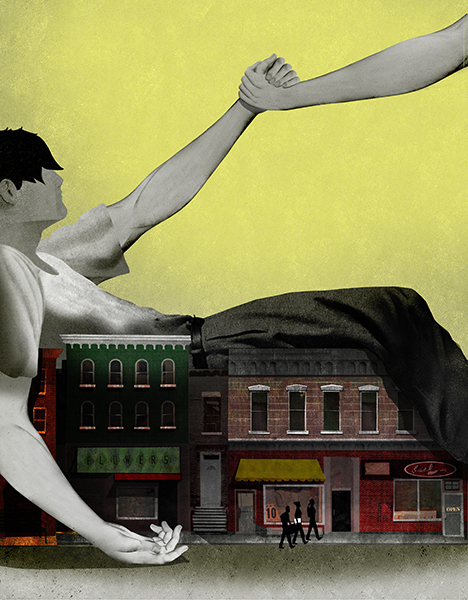 The communities most at risk tend to fluctuate, and sudden changes, like this spring’s eviction of the heroin camps along Lehigh Avenue, can create community crises that make Narcan training more urgent. The program’s vision is to spread knowledge far and wide to save as many lives as possible, wherever education is needed. The epidemic has no boundaries, and neither can the antidote. Med Crew (Back row, left to right:) Sean Welch, Chris Fong, Kyle Samson. (Front row, left to right:) Yasmina Samaha, Camille Singh, Kristina Thompsen, Alexa Profozich, Kathleen Nelson. There are reminders, over the course of a day, that fixing even a small part of the crisis is a challenge. A corner store employee who asked to be trained no longer works there, Singh discovers. There’s someone interested at the 7-Eleven, but he’s afraid of what his boss will think if the students approach him while he’s working. Space is too tight inside a produce market and the owner doesn’t want to disrupt her customers with a training. But the program’s reach is clear nonetheless. During a check-in at an exterminator where the students left Narcan on a previous visit, the woman running the shop asks for an additional dose that she can give to her father. Her stepmother has already had multiple close calls with fentanyl, and she doesn’t want her father to worry that she’ll die if an ambulance is slow in arriving the next time. “You guys are the best!” she yells to the students as they leave. By the end of a day on the avenue, Singh’s voice has turned to a rasp, sapped by hours spent under the El, where the lack of sun makes the day feel that much colder. She promises a return to a thrift shop where workers want training but are busy unloading a truck. Singh displays a sureness in her conversations in Kensington, a level of comfort no matter who she’s dealing with. She says some community members express disbelief that she would take the time to train them. It’s a sign of just how thoroughly the crisis has cast out its victims. That’s the driving ethos of the program, a sense that everyone deserves care, and that anyone can provide it. this is a fantastic program. It brings the students outside of the classroom and viewing firsthand what current conditions and needs are for a community. It certainly can influence their choices for future paths. This may also eradicate preconceived impressions of addicts and better understand this personality type. Also encourages giving back to a community.More universities should follow this example. These students are doing something incredible to help, and the vision for this program will certainly put help where help iis needed. Proud of my Alma mater. Come a long way since 1960.